Two missiles slammed into the southern Israel resort town of Eilat early Wednesday morning, causing damage to a residential area, but, miraculously, no injuries. Area children, who had only recently arrived for school, were rushed to bomb shelters. Israeli forces said the missiles were fired from the Sinai Peninsula, where various regional terrorist groups including Hezbollah and Al Qaeda are known to have set up shop in recent years. Egypt initially rejected reports that the attack had emanated from Sinai, but later Egyptian forces began searching the area for possible launch sites. A mock cease fire agreement between Israel and Gaza was concocted politically by USA and Egypt. Secretary of State Hilary Clinton was the conduit by which President Mursi of Egypt was “persuaded” to mediate or actually command this cease fire. Obama most probably threatened the brand new Egyptian president with removal of financial support unless he intervened to mediate a cease fire. 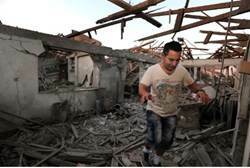 13 rockets were launched by Hamas in the Neguev AFTER the cease fire went into effect! And yet Israel is still honoring the “cease fire”! This is only giving them time to rearm! The sense of betrayal that we and many in the Neguev feel is huge! PM Benjamin Netanyahu declared that this cease fire is the right thing to do in order to allow the Israeli citizens to go back to routine. He stated that Israel hit many targets in Gaza, decreased their arsenal of rockets substantially and seriously hurt the command chain of the Hamas. But he added that a much more drastic operation may be needed at a later stage. Our question is when is a “later stage”? How many more rockets does the Hamas need to shoot against innocent Israeli civilians before the “later stage” comes and a MUCH more drastic operation is put in effect? In Gaza they have been celebrating tonight their victory against the Zionists! Pray for confidence and determination in the Israeli government to finnish what they started so that the citizens of the Neguev can celebrate their family Shabbats with peace and quiet and without rockets flying over their heads for all the years to come. All over the Neguev there are demonstrations against the intended cease fire and while all those talks about an artificial cease fire are going and the Secretary of State of the US Hilary Clinton is right now having a talk with Israeli PM Benjamin Netanyahu, the Hamas has been freely launching more and more Kassam Rockets all over Israel! The more they talked about cease fire today more Israelis were hurt and in fact two men were killed and one of them an IDF soldier of 18 years old and many wounded by shrapnel or shell shock. The Hamas rockets reached Rishon Letsion today a large city South of Tel Aviv and hit an 8 story building destroying the top three stories! A real miracle happened on the top floor that was totally destroyed as a family of six had obeyed the security instructions and had taken shelter in the bomb shelter room inside of the apartment! The whole apartment was totally destroyed by the rocket but the armoured room was intact and so was the family six, praise be to YHVH! In Ashdod, Ashkelon and Beersheba there were many attacks today and many miracles of people rescued from death. In one case a single mom with a little girl heard the Red Alert sound while in the shower. She was wondering whether to get out of the shower and get into the armored room with her daughter and at the last moment she felt an urge to take shelter! As she managed to reach the special secured room in her apartment, a kassam rocket hit her building penetrating her apartment through the shower where she had been seconds earlier and destroying it completely! Had she not obeyed the security instructions because of convenience, she would have been killed and her daughter also! One of our team members leaves in Beersheba and works in a nursing home as a nurse. She told me today over the phone how hard it is for many of the elderly residents to get into the bomb shelter, some of them cannot even move from their beds! Please pray for the elderly in nursing homes and elsewhere, for pregnant mothers, for lactating mothers, for the handicapped, for those with down syndrome, for those in hospitals, for birthing mothers and babies and all challenged people to be totally protected by the Almighty when the rockets fall! The response of the IAF (Israeli Air Force) was very serious tonight against Hamas after a very terrifying day. The entire government building of Hamas has been completely destroyed, nothing is left of it and other serious targets have been hit! We must pray seriously that no cease fire will happen before the terror infrastructure is totally destroyed or Israel takes over Gaza completely. We must pray to silence all the demonic voices from the political activists and international media that is presenting Israel as the aggressor and Hamas as the poor victim. “Woe to those who call good bad and bad good” and this is what is happening right now in the international press and especially in the UK and the BBC radio but in other places as well. Schools across southern Israel were closed Sunday morning after missiles fired by Gaza-based Palestinian terrorists hit two homes and wounded seven people Saturday night. Shortly after midnight, the first Grad missile landed just outside the southern city of Beersheva, causing no injuries or damage. Not long after, a second Grad slammed into the nearby town of Netivot, heavily damaging two homes. Three people were lightly injured while running for their bomb shelter, and another four were treated for severe shock. Among those treated was Pinni Azoulai, whose house was completely destroyed by the missile. Azoulai heard the early warning siren just in time to hide in is bathroom, one of the only rooms in the house to not collapse when the missile struck. “This was a miracle,” Azoulai later told Israeli media. Rocket attacks against southern Israel have been intensifying over the past two weeks, and in response Israel has been launching more strikes against terrorist targets in Gaza. “We’ve had enough of living in fear,” a Beersheva resident told Israel’s Ynet news portal after Saturday night’s attack. Defense Minister Ehud Barak recently warned that if the situation does not calm down, Israel may retake Gaza, which it surrendered to full Palestinian rule seven years ago. “If the cabinet orders the IDF to conquer and control Gaza, this is something that is possible today,” Barak told a conference at the Fisher Brothers Institute for Air and Space Strategic Studies. Gaza terrorists fired two Kassam rockets near Sderot Sunday, one of them damaging a building. One person was treated for shock. 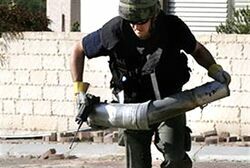 Gaza terrorists fired two Kassam rockets on the Western Negev Sunday, one of them damaging a building in the industrial area near Sderot, located less than one mile “as the rocket flies” from northern Gaza. One person was treated for shock. Terrorists from Hamas-controlled Gaza have continually attacked the Western Negev since the government expelled Jews from Gush Katif and withdrew all IDF personnel in the summer of 2005. Dozens of people have been killed and hundreds have been injured, not including thousands of residents who have suffered shock and trauma. Based on previous terrorist attacks, the IDF is expected to launch a symbolic counterterrorist attack against smuggling tunnels or weapons manufacturing plants that are known to exist but are not targeted until there are rocket attacks. 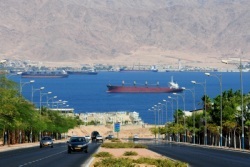 Terrorist forces presumably operating out of the Sinai Peninsula fired two GRAD-type missiles at the southern Israel town of Eilat on Wednesday night. 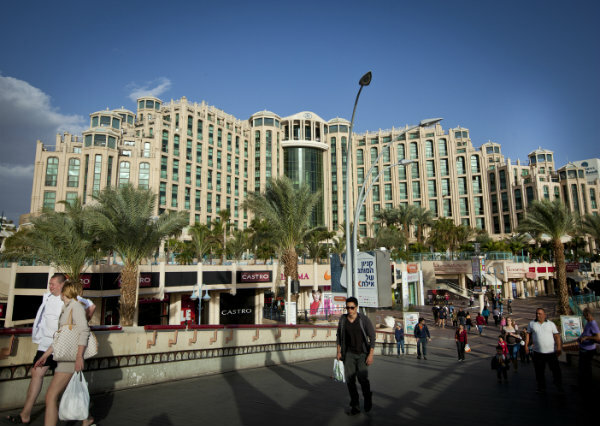 Both missiles landed in open areas outside of Eilat and did not cause any injuries or damage, but did result in a degree of panic in the bustling Red Sea resort. The missiles rocked Eilat just as popular Israeli singer Eyal Golan was beginning a beach-front concert for 4,000 fans. Police officers quickly got on stage and told the crowed to evacuate the premises. The little known Salafi Front in Sinai claimed responsibility for the attack, as well as for a string of assaults on the Egypt-Israel gas pipeline over the course of the past year. Another Sinai-based Salafi group, the Army of Islam, threatened to launch a wave of suicide bombings in Cairo if government forces did not stop harassing the Islamist groups. Salafi Muslims are seen as even more radical then their Sunni brothers, and Egypt’s largest Salafi movement won a considerable number of seats in Egypt’s recent parliamentary election, placing second only to the victorious Muslim Brotherhood. There is mounting concern in Israel that the situation in Egypt will begin to mirror that in Gaza, where a larger terror groups holds the reins of political power, and ultimately does little or nothing to stop smaller, allied terror groups from attacking Israel. Providing further evidence that its end goal, whether through nuclear weapons or other means, is the destruction of Israel, Iran’s president last week insisted that the “annihilation of the Zionist regime” is a mission of global importance. “Any freedom lover and justice seeker in the world must do its best for the annihilation of the Zionist regime in order to pave the path for the establishment of justice and freedom in the world,” Iranian President Mahmoud Ahmadinejad was quoted as telling a gathering of ambassadors from Islamic countries in Tehran. Ahmadinejad went on to claim that the Zionists [read: Jews] have been controlling world events for the past 400 years. It is because of that virulent hatred for Zionism, Israel and the Jews in general that Israel has been so strongly urging the world to take the Iranian nuclear threat more seriously. And while some will argue that, as president, Ahmadinejad doesn’t have the final say in Iran, Israeli Prime Minister Benjamin Netanyahu cautioned that Iran’s true leader is even more dangerous. Iran’s Ayatollah Ali Khamenei “is not a rational leader, just like the leader of North Korea. They are unpredictable,” Israel’s Channel 2 News quoted Netanyahu as telling a recent closed-door meeting of his cabinet. Netanyahu reportedly went on to explain that while he has no desire to go to war with Iran, he is forced to believe that the religious-fueled hatred expressed by both Ahmadinejad and Khamenei will result in them eschewing the pragmatism Western commentators speak of and launching nuclear weapons at Israel.